Soho at Christmas–but it is lit this way year round! Aongus and I aim to make the most of every free day we have in London. I’m back at Gatwick now, flying to a speaking engagement in Dublin, and reflecting on the past 24 hours. After work yesterday (7PM Friday), we met in Covent Garden. First strolling aimlessly, for the purpose of exercise and air, we found ourselves in Soho when Aongus’ hunger pangs won out. We stopped in for Dim Sum at the Golden Phoenix restaurant on Gerrard Street, London W1D 6JE, in the heart of China Town. Aiming to try new things as often as possible, we thus enjoyed our first dinner on Gerrard Street. The custard-filled buns at the Golden Phoenix were particularly delicious; we will skip ordering a saucy dish next time and stick to the dumplings! Today (Saturday morning) we awoke for a trip to Kensington via the London underground. I’d booked cream tea for two at Harrod’s. The store and its surrounding streets had a festive holiday feel. After tea, we browsed and even made a small purchase (but not Italian luxury furniture, unfortunately!). In our photos of furniture-testing, you’ll see Aongus trying out his new BauBax 2.0 travel jacket. In a recent Kick Starter campaign, I had ordered us matching bomber jackets. Today we donned these early Christmas presents, and Aongus is delighted with his. I’m an architect and I am quite detail-oriented, so although I’m happy with several of the innovative features, I am not entirely satisfied with the overall product–at least not in the medium size for women. Harrods interior stair. The building is a-maze-ing. It seems to me they tested the BauBax 2.0 design on the large size for men. Several of the features promised–most notably the interior iPad pocket–are too small in the version for ladies. My iPad is a few millimeters too long to fit, and they now say the ladies version will only fit an “iPad mini” which I have not found to be a useful tool. Nevertheless, there’s still a pocket for the iPad pencil. Not too useful if you can’t bring your iPad! It’s important to have pockets when Ryanair won’t allow baggage aboard without add-on fees. I like to travel with as few bags as possible! So, while the garment does have several nice design features, the final product appears to have been rushed out of the factory. Many of the seams and details in mine are of poor quality. I’ll need to bring it to a tailor to remedy its shortfalls, and I’ll not buy clothing online again. I guess it boils down to the fact that when it comes to buying cars, computers, and clothes, I’m not an Innovator according to Rodger’s Adoption model–those folks bought the BauBax 1.0 on Kickstarter. I’m also not completely comfortable as an Early Adopter, as I’ve ended up with second-iteration products that still needed some refinement–including this BauBax 2.0 and a 2004 Nissan 350Z. I really loved my Z car but it, and its 2003 and 2004 siblings, came out of the factory without its tires balanced! They didn’t realize that tire-balancing issue until they’d rolled 14 months or so of these two-seat sports cars out of showrooms. Tires started failing at 16k miles and had to be replaced. So now I know definitively–I need to wait for v3.0. Just be an Early Innovator and enjoy the benefits of having a refined design rather than a cutting-edge showpiece. I am, however, very happy with the smile on Aongus’ face and the fact that he says the shape of the jacket is flattering. Fortunately, with time and use, I’m beginning to identify which pockets can fit which items–which doesn’t exactly align with the BauBax info sheets that we studied meticulously–but I’m finding systems that work for me. So as you see from Aongus’ reclined testing position at Harrod’s furniture showrooms, we rested a bit on some cozy chairs, identifying ideal options for our future. After discussing chair designs with a furniture rep, we viewed some women’s fashions. We enjoy seeing the bizarre clothing designs on offer here and at Harvey Nichols, but we quickly had our fill and headed out and down to the street. Following a zesty Lebanese tagine at Comptior on Exhibition Road–a cafe we had previously enjoyed with my cousin Kaitlin–we headed over to the Victoria and Albert Museum to absorb some art and history. We particularly enjoyed the stained glass and the new section for photography. You’ll see photos of the building and also from the Buddist, metalwork, and photography sections. The sun had set and there wasn’t much time before my flight to Dublin, so we dashed to the South Kensington tube station and jumped onto a District line train. We said a quick but heartfelt “goodbye and see you Friday” as I disembarked at Victoria Station and climbed the stairs to the National Rail station on the ground floor. Despite construction works around Gatwick that delayed the train 15 minutes, I arrived and cleared security with plenty of time for a browse at Dixon’s and a healthy salad from Pret before I hit the runway–putting my travel jacket to work. Ciao, Britain. See your other side on Tuesday! Hampton University sketching in Paris, on a rainy day. Spent a lovely week in Paris, much of it with Hampton University’s architecture program. I’ve attached a few of the pics I snapped with my iPhone. 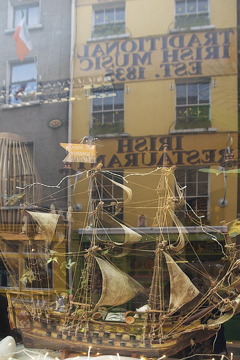 I’m back in Dublin now, and getting around to downloading the photos from my Nikon. The photos will help me reminisce of my travels once I head back to the States. I might even have time to write something meaningful on my blog once again…. For now, pictures will have to do! A passage, or gallery, of Paris. Teh Louvre, with a dramatic sky. The music festival in full swing. In the middle of the Seine. Baby bottles!?! You just never know in Paris…. One last glimpse of my beautiful Porto and my Fulbright trip there, just before I introduce you to Problem-Based Learning in Belgium…. I travelled half the coast of Portugal during my week-long stay. …and finally discovered the spelling of “thank you” in Portuguese. 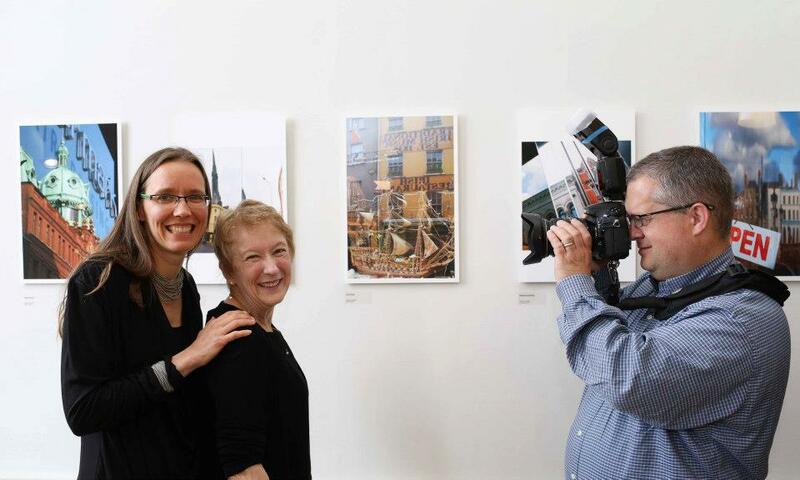 Dave Chance did a delightful job documenting events at the opening of my first photography exhibition, InterChanges: Reflections from Dublin and Beyond. Thanks to all my fabulous friends and colleagues for coming out to support my work! By the way, I’ve sold six photos to date. If there’s one you see on the wall that you’d like to purchase, please let me know. They are selling for 80 Euro each and sales are helping me recoup the cost of producing the show. This is when things were just starting to roll…. My mum with Fulbright Ireland’s Courtney Cokley. with former Fulbright Sinead Murnane. with (DIT engineering lecturer) Kevin and (his photographically inclined wife) Olive Gaughan. Head of Fulbright Ireland Colleen Dube, her mum, and dean Mike Murphy. Colleen Dube and Mike Murphy — my Fulbright hosts! Sarah Conroy and Ted Burke. with DIT engineering dean Mike Murphy, engineering lecturer Ted Burke, and web designer Sarah Conroy. Mike Murphy, Sarah Conroy, and Ted Burke. My co-teacher at DIT, Orla Hanratty. Patrick Flynn and Eileen Goold. Cara Delay and her husband, Paris. with Fulbright Cara Delay and Paris. Architecture lecturers Patrick Flynn and Jim Roche. My mum, Cynthia Mara recited one of her poems about Ireland. My (former Fulbright) mom and me! Architect Mairtin D’Alton and Marie Curie Scholar/former Fulbright Nancy Stenson. Orla Hanratty and Kevin O’Rourke — both from DIT’s Learning, Teaching and Technology Centre (LTTC). with Mom and Richard Hayes. Tom Kelly, (Fulbright) Cara Delay and Paris. Mike Murphy, Eileen Goold, and Notre Dame’s Lisa Caulfield. Orla Hanratty and her friend. with Christine and (Fulbright) Scott McDonald. Musicians Frank Cullen and Jerry Crilly. with Arcadia University’s Tom Kelly. with Frank Cullen and Jerry Crilly. with musicians Frank Cullen and Jerry Crilly. Christine McDonald and architect Mairtin D’Alton. Jerry Crilly and Eileen Goold. with Fulbright Ireland’s Joanne Davidson. Jerry Crilly and Dr. Eileen Goold. The Spanish architect Santiago Calatrava has designed some of the world’s finest train stations and bridges. The station in Lisbon reflects the care and precision of Calatrava’s design work. Lisbon is a glorious city. I was truly blessed to spend five glorious days in this place–the capital of Portugal–as part of the Fulbright Inter-Country Lecturing Program. I will never forget my time there, the places I visited, or the people I got to know. This Art Noveau Metro entry must have been moved to Lisbon from Paris. …home to some of history’s most accomplished navigators. It has been described as Manueline, Plateresque, Renaissance architecture. …is an architectural and structural marvel. You can visit the photo show any weekday 9-5 through May 31 — it’s free and open to the public! If you want to view it with me, I’ll also be in from 12-2 on May 22 and 27. Moreover, you can email me (shannonchance at wm dot edu) to let me know if you’d like me to meet you there at another time that’s convenient for you. “Essence of Beauty” is one of the photos on display at Notre Dame’s O’Connell House now through May 31. Copyright Shannon Chance. 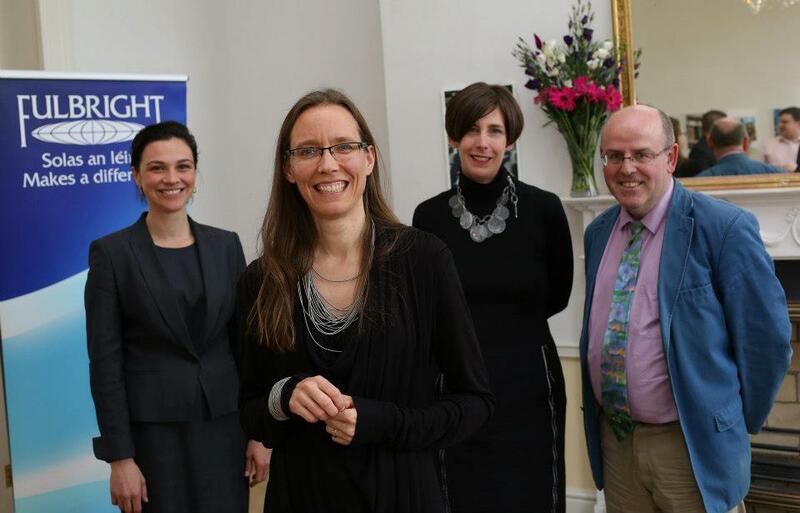 The staff of Fulbright Ireland and Notre Dame’s O’Connell House organized a spectacular event for last night. The opening of the photography exhibition was a highlight of my year here in Dublin. So many people were there who have been instrumental in making this year a success. Fulbright hired Conor McCabe Photography to document the event, and purchased the photos posted on this page. I hope you’ll enjoy the photos as much as I do!